If you’re tired of filling propane tanks, then let us help you. We specialize in running above ground and underground gas lines for outdoor BBQ’s, pool heaters, fire pits, outdoor kitchens and torches. We run them for both natural gas (NG) and liquid propane (LP). Call us today for a free quote. We are your source for barbecue gas lines in Portland, Oregon. Our Spring and summers are short here in the northwest. Why not take complete advantage of them. By having a gas line ran to your bbq, you’ll take your outdoor entertainment area to the next level of comfort and style. We can plum your barbecue right into your gas system and you will never have to fill a propane tank again. Gas can be ran to patio heaters, fire pits, outdoor fireplaces and overhead heaters so you can enjoy your outdoor area year around. From a simple barbecue hook up to gas piping all your backyard appliances, we are only a phone call away. 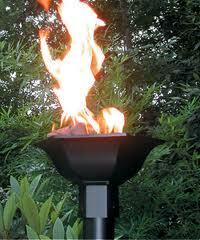 Outdoor Gas Fire Pits and Tiki Torches have grown in popularity over the years. From campgrounds to backyards, gas fire pits are taking over because they are easy to use and very safe. Portland Heating and Air Conditioning can run the gas line so you will never fill a propane bottle again. 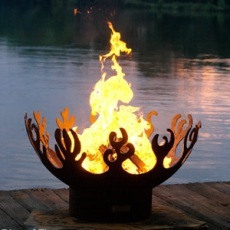 Outdoor living rooms are featuring more upscale gas fire pits. 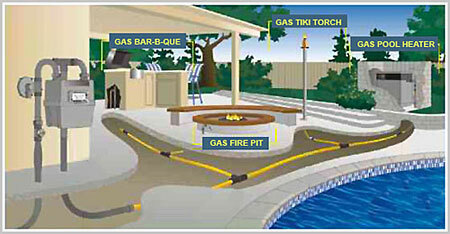 To have an outdoor fire pit or tiki torche, the gas line must be ran correctly with the proper equipment. Spend a quiet evening with family and friends and enjoy the fire!